Looking for a delicious Paleo recipe for a freezer cooking session? This one is so easy to throw together, tastes amazing, and is full of vitamins & nutrients to please even the healthiest momma! Even better, the kids will love it and ask for it often. Even those that aren't a fan of beets normally will be asking for the recipe! 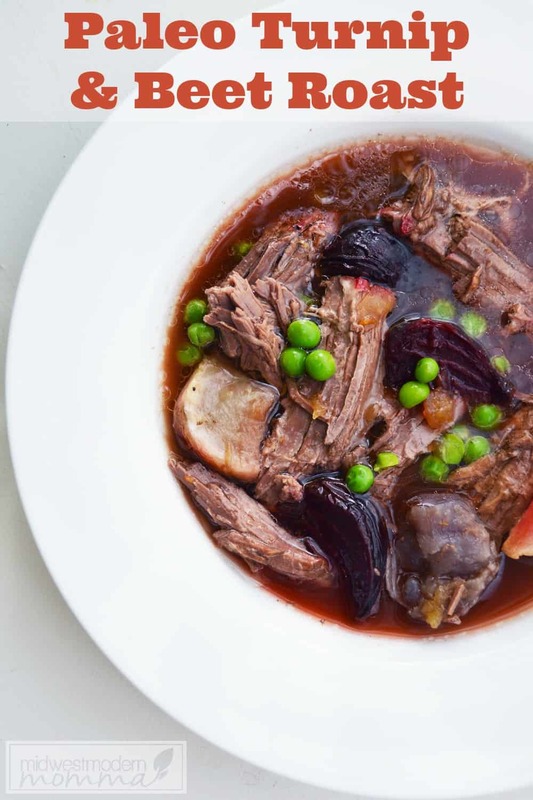 When you think about a hearty freezer meal, this Paleo Turnip, Beet & Beef Roast dish is a great example. Not only is it hearty and satisfying, it is a great option for freezer meals since it stands up to cooking, freezing and reheating easily. You can even set it up and use it for an easy meal by prepping everything and putting in the freezer raw, to pull out and toss into your Crockpot and cook on low all day. Regardless of the method you choose, this is a beautiful and delicious freezer meal that everyone in your family will love. If you are preparing this to freeze and cook at a later time, it is very simple to get started. Thoroughly wash all vegetables. If you prefer, you may spend some time to peel the beets and turnips at this point. We leave the skin on them, but some prefer to remove it. 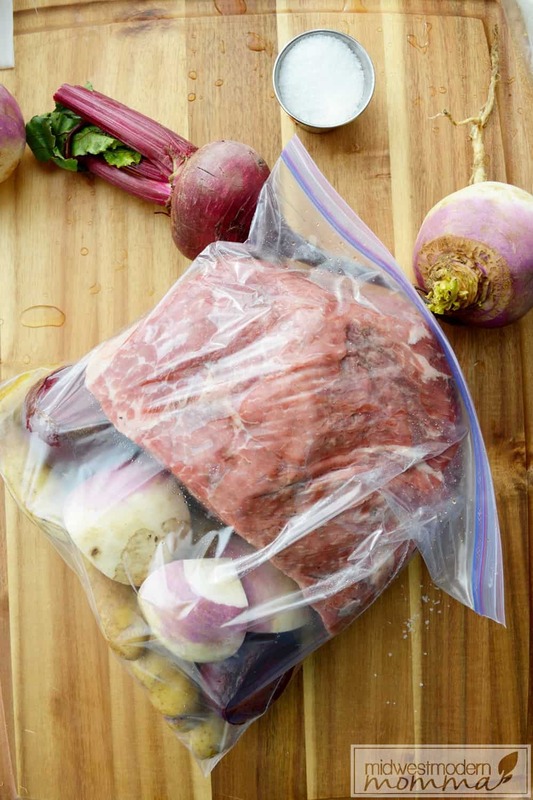 Cut the beets and turnips into quarters, and place those in a large freezer bag with the meat and potatoes. When you are ready to cook this meal, remove from the freezer 24-36 hours before you would put into Crockpot. While it is sealed in a bag, you may want to thaw it in a dish just in case any juices dripped out. Pour your bag of ingredients into your Crockpot the morning you want to make this meal. Add in the beef stock, onion puree and red wine as listed in the directions below. Season to your preference with things like garlic powder, onion powder, bay leaves, salt and pepper. You'll cook on low for around 8 hours, but some Crockpots will run hot and may need to stop cooking earlier or cook on higher heat setting. 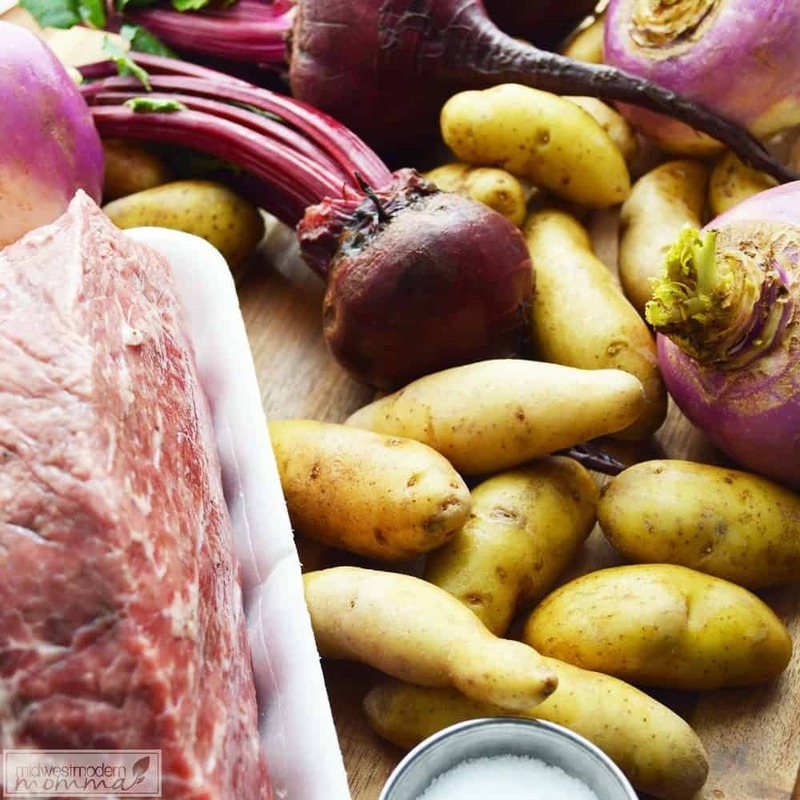 When you think about a hearty freezer meal, this Paleo Turnip, Beet & Beef Roast dish is a great example. Not only is it hearty and satisfying, it is a great option for freezer meals since it stands up to cooking, freezing and reheating easily or you can freeze everything in a bag for an easy dump Paleo recipe! This is a beautiful and delicious freezer meal that everyone in your family will love. 1 bottom round roast the weight will depend on your personal needs. Thoroughly wash all of the vegetables, you may choose to peel the beets and turnips or leave them natural. Cut the beets and turnips into quarters, place in the large freezer bag with the meat and potatoes. When ready to cook: remove from the freezer and place in the fridge about 24 to 36 hours before putting together in the crockpot. 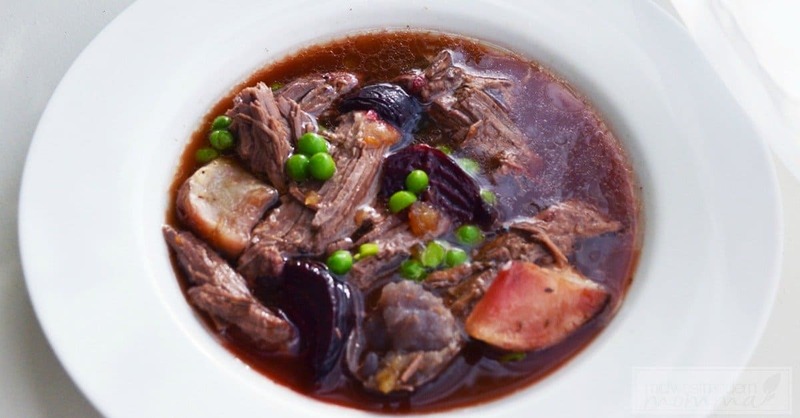 Pour 3 cups of beef stock into the crock along with ½ cup onion puree and ½ to 1 cup dry red wine. Season to your preference, cook on low for 8 hours (depending how hot your crock pot runs). If you are on a strict Paleo diet or AutoImmune Protocol, you can leave out the white potatoes, add carrots, or just increase the other veggies. Think white potatoes aren't allowed on a Paleo diet? Check out this post that convinced me they are okay every once in a while! This turnip, beet, and beef roast is a great hearty meal that everyone in your family will love having. For those kids (or adults!) that think they won't like beets or turnips will quickly change their minds with this delicious roast. Oh my goodness! This looks so good and I love that it is a freezer meal. Thank you so much for sharing this over at Healthy Living Link Party, I will be featuring your recipe! Hope to see you again! Pinned! Thank you! I’m a huge fan of stocking with the freezer with healthy meals. It’s such a great time & money saver! I love the prepacked freezer meal idea and also stocking your freezer with healthy meals when you are in a rush. Thanks for sharing at #overthemoon link party. I’m sharing on social media. Have a lovely week and see you next week. Thanks for sharing! I love being able to stock up on healthy meals for those busy days when the last thing I want to do is cook! This sounds like a very healthy and delicious dish! Thank you for sharing at Fiesta Friday party! I hope to see you again next week!